The Afro-Asian monsoon is a belt-like system that extends from North Africa via South Asia to East Asia. Anomalies relating to its intensity and position can trigger widespread droughts and floods in different regions simultaneously. Therefore, investigating its interdecadal variability is of great scientific and societal importance. Prof. Yihui Ding from the National Climate Center, China, along with his collaborators, have concluded that the Afro-Asian summer monsoon will continue to enhance and move northwards following the initial stage of the Atlantic Multidecadal Oscillation (AMO) warm phase since the mid-1990s. 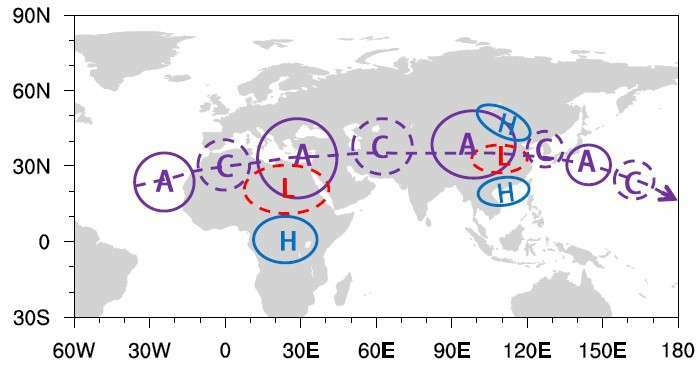 The mechanism for this interdecadal shift of the Afro-Asian summer monsoon was investigated in a recently published study. "Precipitation in the Huanghe-Huaihe River valley increased in the late 1990s," explains Prof. Ding. "And since then, the rain belt in Eastern China has marched northwards to the Huanghe-Huaihe River valley. Along with the recovery of precipitation in the Sahel, the integral rain belt of the Afro-Asian summer monsoon has shifted northwards. The reason for the northward shift of the Afro-Asian summer monsoon rain belt and the in-phase increase in precipitation over the Sahel and Huanghe-Huaihe River valley since the late 1990s is the coupled responses of wind, sea level pressure, and surface temperature, to warm the sea surface temperature anomalies in the North Atlantic." The AMO is the main natural forcing for the interdecadal variability of the Afro-Asian summer monsoon. A teleconnection wave train with alternating cyclones/anticyclones exists in the upper troposphere. Along the teleconnection path, the configuration of circulation anomalies in North Africa is characterized by coupling of the upper-level anticyclone (divergence) with low-level thermal low pressure (convergence), facilitating the initiation and development of ascending motion in the Sahel. Similarly, in East Asia, a coupled circulation pattern also excites ascending motion in the Huanghe-Huaihe River valley. The synchronously increasing precipitation over the Sahel and Huanghe-Huaihe River valley can be attributed to the co-occurrence and in-phase changes of ascending motion. Why did rainfall over Asian inland plateau region undergo abrupt decrease around 1999?